Student loans have become a huge problem. According to an analysis of government data from Edvisors, some 70% of recent college grads have education debt, and the total amount borrowed works out to an average of more than $37,000 per borrower. So burdensome is this debt that more than 40% of borrowers are behind on their payments or have stopped making them altogether, according to the U.S. Education Department. What can you do to avoid that fate? Here are four ideas — two geared toward families of high school students who haven't taken out student loans yet, and two aimed at college students who have borrowed. 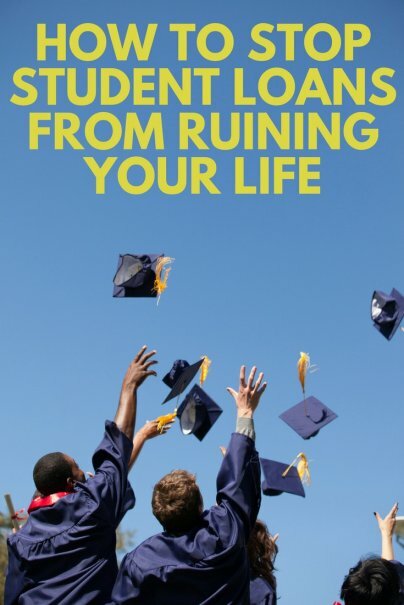 Of course, the best way to keep student loans from ruining your life is to avoid borrowing in the first place. Here are two steps that can help. One reason why college costs so much for so many students is that so few graduate in four years. According to "Four-Year Myth," a report from Complete College America, the four-year graduation rate at public universities ranges from 19% to 36%. Some who fail to graduate in four years drop out, others flunk out, but many others end up with extended stays on campus because they change majors. College is a very expensive place to "find yourself." It's far better to enter school with as much clarity as possible about what you want to study. Knowing what you want to study can help you avoid the five or six-year college plan and its associated costs. Taking a year off in between high school and college has been a popular practice in Europe for many years and is rapidly growing in popularity in the U.S. So much so that there is now a gap year association as well as consulting organizations that help families (for a fee) determine whether a gap year makes sense for their children, and if so, how to best structure the gap year. Some schools will accept students and then allow them to defer enrollment for a year. The University of North Carolina even offers a global gap year fellowship. If you have already taken out loans to pay for college, here are two practical steps for minimizing the burden of such borrowing. Numerous surveys have found that students with education loans have little idea what they've gotten themselves into. A recent survey by Lendedu, a company that helps students refinance their education loans, found less than 10% of student borrowers understood how long it would take to pay off their loans or what interest rate they were being charged. Less than 30% understood that if they fail to repay on time, the government could garnish their wages or withhold their tax refunds. A couple of years ago, a study by the Brookings Institute found that among first-year students who had students loans, 17% said they didn't realize they even had loans. If you're going to borrow, you need to know that you owe, what you owe, and what it's going to take to repay. One of the best reality checks is to calculate the monthly cost of your loan payment while you're still in school. Then create a detailed post-college budget using a monthly Cash Flow Plan form. Creating a budget that includes student loan payments may motivate you to avoid taking on more debt. At very least, it'll help you understand how much you can afford for housing and other expenses after you graduate and may persuade you to avoid taking on other debts, such as a car loan. Under a standard loan contract, a student loan is to be paid off in 10 years. But you don't have to take that long, and the sooner you can be done with debt, the better. Especially since there are no penalties for paying off a student loan early, commit now putting your debt on an accelerated payoff schedule. The monthly cost calculator mentioned above enables you to run some what-if scenarios based on adding different amounts on top of your required payments. Seeing how much more quickly you could be out of debt may motivate you to live well beneath your means after graduating in order to prioritize accelerated debt repayment. Today, the burden of student loans is causing many young people to delay getting married, put off starting a family, and give up on buying a home. But it doesn't have to be that way for you. Whether you're a high-school student who's just thinking about college financing options or a college student who has already taken on debt, these simple steps should help you keep student loans from taking over your life.